The MG Squared Camera Lowering System utilizes a patented spring assisted connector assembly developed to operate multi-function surveillance cameras (color, B/W, thermal, IR) as well as other ITS roadside and security devices. 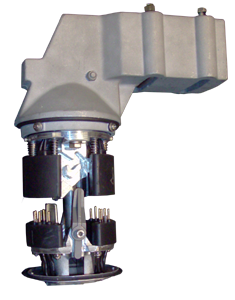 Our standard MIL-SPEC connector body is molded in thermosetting synthetic rubber designed to handle the harshest environments. The connector pins allow for typical camera functions such as pan, tilt and zoom as well as data transfer needs including 100 base TX standards. The unit is rated for winds of 130 mph (210 km/h) with a 1.3 gust factor and a 1.6 safety factor.